This lightweight tapered polished aluminum handle is 5/16" in diameter and 4 1/2" long. The pin vise comes complete with our 44-P pin, a hardened high carbon steel replaceable pin and a safety cap. 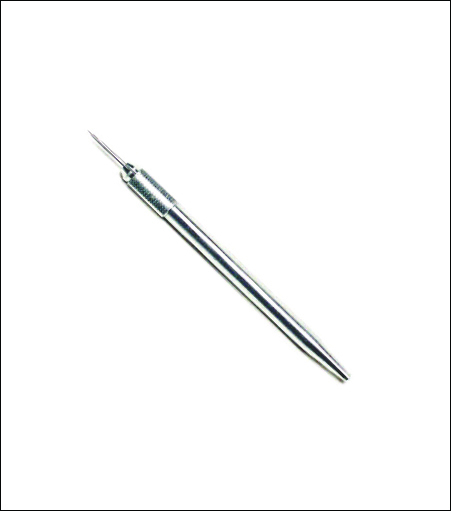 This tool features our high quality 4 jaw chuck for sturdy and secure pin positioning. This tool is widely used in the sign industry for weeding, lifting, perforating, picking and air release of lightweight materials such as vinyl, plastic, wood, film and cloth. This handle is made for the 44 pins, but is also compatible with all 7 series blades, and all blades that fit in the industry standard #1 knife.